Frank Gore just won’t quit. On Monday, the ageless running back agreed to sign with the Bills on a one-year, $2MM deal, as Adam Schefter of ESPN.com tweets. Gore, 36 in May, continues to defy the odds with productive season after productive season. Last year, Gore managed 4.6 yards per carry off of 156 attempts and added 12 catches for 124 yards. He no longer profiles as a workhorse back, but he’s still extremely effective when used in the right measure. In addition to being extremely efficient last year, Gore also graded out as the Dolphins’ best pass-blocker, per Pro Football Focus. Football Outsiders’ metrics lauded Gore as well, as he ranked as a top-20 back in DYAR, DVOA, and success rate. The Bills already have star LeSean McCoy leading the way with Chris Ivory in reserve, but Gore could be a change-of-pace option as the Bills move forward. The extra insurance can’t hurt, especially since McCoy averaged a career-low 3.2 yards per try in 2018. The rumors of the Patriots‘ demise in recent years have been greatly exaggerated, but even though the club is still heading to the playoffs and remains in the hunt for a first-round bye, it doesn’t appear that this is the same New England team that we have become accustomed to. The Pats’ aging stars are beginning to play like aging stars, head coach Bill Belichick‘s future is uncertain, and Jason La Canfora of CBS Sports says there is some concern about how the team will function when owner Robert Kraft fully transfers control of day-to-day operations to his son. As such, La Canfora believes the club could see a mass exodus of coaching and front-office talent this offseason, with OC Josh McDaniels, DC Brian Flores, and director of player personnel Nick Caserio all potentially on the move. Of course, New England could turn it on and roll to another Super Bowl title, but even if that does happen, this could be a very tumultuous winter in Foxborough. Mike Reiss of ESPN.com observes that Josh Gordon‘s indefinite suspension marked the Patriots‘ 26th transaction involving a wide receiver this year, which is unusually high. It reinforces how difficult it has been for New England to decisively address its WR needs — and it also calls into question the team’s decision to part with Brandin Cooks and Danny Amendola — and Reiss believes the Pats will make receiving talent a top priority this offseason. We learned more troubling details about Gordon’s suspension this morning. We have heard that the Dolphins could be in for a major overhaul this offseason, and like his colleagues, La Canfora believes that owner Stephen Ross could part ways with vice president of football operations Mike Tannenbaum and head coach Adam Gase. However, La Canfora reports that Ross thinks highly of general manager Chris Grier — who holds the GM title but who does not have final authority over football decisions — and that Grier is likely to remain with Miami. If the Dolphins do go searching for a new executive this offseason to replace Tannenbaum, Vikings assistant GM George Paton would be near the top of the list, as we heard earlier this month. 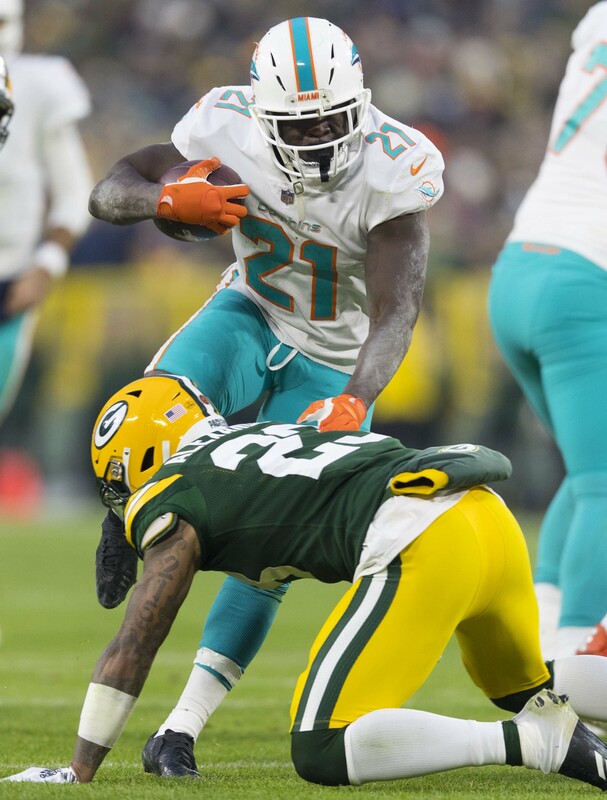 Dolphins running back Frank Gore, whose season came to a premature end due to a mid-foot sprain, has already indicated he wants to play in 2019. And, as Safid Deen of the South Florida Sun Sentinel writes, Gore wants to return to Miami. Given the surprising success that he had with his hometown Dolphins this year, Gore may get his wish. Ralph Vacchiano of SNY.tv lays out the Jets‘ biggest offseason needs — pass rusher, wide receiver, running back, and offensive line — and offers his take as to how to best address those needs. Darryl Slater of NJ.com looks at how head coaching candidates might view the Jets‘ soon-to-be vacant HC position, and he concludes that, although it has some drawbacks, it is still an attractive opening that will tempt some of the team’s top targets. Although he will miss the remainder of the season after suffering a foot sprain in Week 15, Dolphins running back Frank Gore will not require surgery, according to Ian Rapoport of NFL.com (Twitter link). Additionally, Gore has indicated that he wants to return for a 15th NFL campaign in 2019, tweets Adam Schefter of ESPN.com. Gore will become a free agent next spring after inking a one-year deal with the Dolphins this past March, so Miami will need to decide if its interested in retaining the veteran back. The Dolphins have younger, intriguing backs on their roster, but thus far, they’ve shown little confidence in Kenyan Drake, while rookie Kalen Ballage only first topped four carries in a single game this past Sunday. Gore’s pact contained a league minimum salary last time around, and a 2019 accord would likely come in around the same figure. Even at age-35, Gore somewhat astoundingly became Miami’s featured back, leading the club’s runners in carries with 156. Gore managed 4.6 yards per rush on those attempts, and also graded out as the Dolphins’ best pass-blocker, per Pro Football Focus. Football Outsiders’ metrics lauded Gore as well, as he ranked as a top-20 back in DYAR, DVOA, and success rate. If Gore does play next year, he’ll get another shot to make his way up the NFL’s record books. He currently sits fourth all-time in rushing yardage, but he’d be able to surpass Barry Sanders for third by posting even a modest 2019 season. Gore could also jump a few spots in the league’s rushing touchdown ledger — right now, he’s tied with Tony Dorsett for 22nd with 77 scores on the ground. Fourth on the NFL’s all-time rushing list, Frank Gore will not have any additional chances to add to his historic total this season. The Dolphins running back will be out the rest of the way with a mid-foot sprain suffered Sunday, Ian Rapoport of NFL.com reports (on Twitter). Monday tests revealed the extent of this injury, Adam Schefter of ESPN.com tweets, and Gore’s first season with his hometown team will end after 14 games. It’s uncertain as to whether Gore will require surgery, with Rapoport adding that decision won’t come for a bit. The bigger question pertains to Gore’s future. He is 35 (36 in May) and playing on an expiring contract. But few NFL running backs have ever exhibited this kind of durability and consistency. Gore has not missed a game since the 2010 season and has only failed to hit the 14-game barrier in one of his 14 NFL seasons. He said in November he was going year-to-year with his career. Despite his age, it would not be surprising if Gore was back for a 15th season. A return would give Gore (14,748 yards) a reasonable chance at surpassing Barry Sanders for third place on the all-time rushing list. With Miami this year, Gore bounced back and finished his slate with 722 rushing yards. That’s the fifth-most by anyone in an age-35 season, behind John Riggins, John Henry Johnson, Emmitt Smith and Marcus Allen. While that does not eclipse his Colts totals — 900-plus ground yards in each of those three campaigns — Gore was better on a per-play basis. His 4.6 yards per carry are the most since his 2012 Pro Bowl season. Gore leads the Dolphins in rushing by a substantial margin over backfield mate Kenyan Drake. Drake and rookie Kalen Ballage will be the primary backs going forward for the Dolphins, who remain in playoff contention. Though, with three 8-6 teams, the 7-7 Fins need a lot of help if they are to make it two postseason berths in the past three years. Dolphins running back Frank Gore left Sunday’s 41-17 loss to the Vikings early with a left ankle injury. The veteran back sprained his foot on the play but avoided a fracture, and is scheduled to undergo an MRI to see if any ligaments were damaged, ESPN’s Adam Schefter tweets. This means his 122-game starting streak, the longest in the league among running backs, is more than likely to end next week. According to Cameron Wolfe of ESPN, the next-longest starting streak by a running back is just 17, held by Christian McCaffrey and Peyton Barber. Gore, 35, finished the day with 14 yards on five carries, and was replaced by rookie Kalen Ballage, who exploded for 123 yards on 12 carries and scored on a 75-yard run. The Dolphins will likely return to the Arizona State product and Kenyan Drake to close the season, assuming Gore is to miss time. It’s been another steady year for the veteran back, who moved into fourth place on the NFL’s all-time rushing yards list, passing Curtis Martin. Set to be a free agent at the end of the season, Gore could seriously contemplate retirement or hope to land with another team to make a run at Barry Sanders — Just 521 yards away — for the No. 3 spot. Frank Gore is heading into the final stretch of his 14th NFL season, but the veteran running back isn’t necessarily ready to hang up his cleats. Gore told reporters that he’s taking it one season at a time as he approaches the end of his career. The 35-year-old hasn’t shown many signs of decline this season. In 10 games with the Dolphins, Gore has compiled 528 rushing yards on 117 carries, and his 4.5 yards-per-carry is his highest mark since 2012. With three more years of similar production, Gore could find himself jumping Barry Sanders and Walter Payton to rank second on the all-time rushing list. For the time being, Gore is simply focused on this season with the Dolphins. That includes a matchup with his former team, the Colts, this weekend. With Indy on the rise, the running back was asked if he may have signed with that organization too early. Defensive end Trey Flowers has been a solid contributor for the Patriots for the past three seasons, but as he enters his contract year, Flowers isn’t guaranteed to land an extension from New England, as Tom Curran of NBC Sports Boston writes. The Patriots, historically, haven’t been willing to invest much cap space in their defensive line, preferring to plug in low-cost veterans or rookies who excel at stopping the run. Chandler Jones, New England’s best edge rusher in recent memory, was traded to the Cardinals in exchange for a second-round pick, as the Patriots presumably had no interest in paying Jones market value. Flowers, 25 next month, played in roughly three-quarters of New England’s defensive snaps a season ago, far-and-away the most among Patriots’ defensive lineman. In that time, Flowers posted 45 tackles, 6.5 sacks, and graded as the league’s No. 14 edge defender, per Pro Football Focus. Even after inking a three-year, $12MM contract, Isaiah Crowell is not expected to become an every-down back with the Jets, according to Manish Mehta of the New York Daily News. The 25-year-old Crowell handled a career-high 206 carries in 2017, but New York has other running backs on its roster that are more capable in the passing game. Bilal Powell and Elijah McGuire will likely handle most of Gang Green’s passing work, leaving Crowell early downs. The Jets figure to trail in many of their games during the upcoming season, meaning Powell and/or McGuire may very well see the lion’s share of the offensive snaps as New York throws the ball in attempts to catch up. Former Seahawks running back Thomas Rawls is also on the Jets’ roster, and could conceivably soak up carries if Crowell falters. Frank Gore turned 35 years old in May, but he’s hoping the move to a grass field with the Dolphins could help prolong his career, as he tells Barry Jackson of the Miami Herald. “Turf is tough on your body and it’ll have you swollen,” said Gore, who played on turf for the past three seasons with Indianapolis. “Playing on turf, I wouldn’t get my body back until that Friday. But when I’m playing on grass, I’m good after the game. I’m happy that I’m on grass.” Gore isn’t expected to be the lead back in Miami, as he’ll compete with Kenyan Drake and rookie Kalen Ballage for carries. But he’ll conceivably serve as something of a mentor to both of those young players, each of whom is under the age of 25. Gore managed 3.7 yards per carry on 261 totes for the Colts in 2017. In case you missed it, the Jets are expected to sign former Mississippi State defensive back Brandon Bryant, who was not selected in Wednesday’s supplemental draft. Here’s the latest on Bills running back LeSean McCoy, who is facing domestic violence accusations from his ex-girlfriend.